The Bengal tiger, also known as the royal Bengal tiger is known as being the most populous of all tiger species. The endangered Bengal tiger is also known for being the national animal of Bangladesh as well as the species tiger Panthera tigris being known as the national animal of India! Conservationists are trying to repopulate but the biggest problems for the Bengal tiger populations continue to be those created by man. Particular problems include hunting, encroachment and cross breeding of species. Where Does the Bengal Tiger Live? The Bengal tiger is native to India, Nepal, Bhutan and Bangladesh. The estimated population of this species of tiger differs in relation to the area being referred to. In India the population of the Bengal tiger is estimated to be around 1,411 wild tigers. In Nepal the population of the Bengal tiger is estimated to be around 155. In Bhutan the population of the Bengal tiger is estimated to be around 67 – 81. 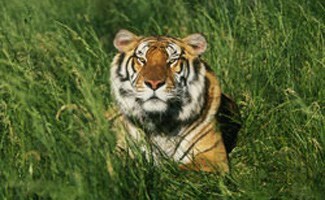 In Bangladesh the population of the Bengal tiger is estimated to be around 200. It may seem that the Bengal tiger is thriving at least in India; however, numbers of 1,411 are minimal when taking in to consideration that an entire species is depending upon the survival of these individuals. The most recognizable feature of the Bengal tiger is the distinctive coat which ranges in base color from a light yellow to an orange and features dark brown to black stripes which form the traditional “tiger stripe” pattern. The Bengal tiger also has a white underbelly and a white tail with black rings around it. Within the Bengal tiger population there are various genetic mutations which have resulted in what are commonly known as “white tigers” which are either all white or white with brown stripes. There is also a mutation within Bengal tiger genes which results in a “black tiger” which is a solid black tiger with white or yellow stripes and while there has been rumor all black tigers existing in the wild, none of these specimens have yet been proven by photographic evidence. The Bengal tiger, like many other species shows sexual dimorphism between the male and female of the species. The male is generally much larger than the female measuring in at around 10 feet long; whereas, the female measures in at around 9 feet long. Both sexes tend to have a long tail which can measure anywhere from 2 to 3 feet long. While the weight of the Bengal tiger differs between individuals the male Bengal tiger is almost always larger than the female weighing in at around 500 pounds, where the female weighs in at around 300 pounds. The Bengal tiger is officially recognized as the largest member of the cat family that has not gone extinct (although some will argue that the Siberian tiger is larger); the smallest member of the “big cat” family is recognized as being the Cheetah. The Bengal tiger does not have a particularly long lifespan in the wild in comparison to some other wild cats and generally will only live to around 8 to 10 years with 15 years thought to be the maximum age. In more sheltered environments such as in captivity or on conservation reserves the Bengal tiger has been known to live as long as 18 years. Tigers may be the largest of the big cat family but this size does not always work to their advantage. For example the size of the tiger may aid it in bringing down prey once it has been captured; however, unlike cats like the Cheetah, the Bengal tiger is unable to chase prey and instead it must stalk its prey and then pounce with great accuracy in order to ensure a meal. The tiger hunts during the dawn and dusk when the sun is not blazing hot and so they are orange with black stripes in order to allow them to camouflage themselves in the tall grass of the marshlands, grasslands, brush and even in the jungle. The black stripes allow the tiger to blend in to the shadows while the burnt orange color of its fur tends to blend in with the bright sun on the horizon allowing the Bengal tiger to take its prey by surprise. The Bengal tiger will most often kill smaller prey with a single bite to the back of the neck where it will kill larger prey by biting in to the throat. Once the Bengal tiger has brought down its prey which can range from wild pigs and antelope to buffalo, they are often times seen dragging the prey in to the shade of the trees or even to the waterline of local wading pools in order to stay cool while they eat. Unlike many cats that tend to eat their fill and leave prey the Bengal tiger can eat up to 65 pounds of meat in one sitting and it will always begin with the back-end of the animal first where a lot of the fattier meaty parts are located. One of the unique things about the Bengal tiger’s eating habits in relation to other big cats is that the Bengal tiger seems to have a much hardier immune system and has been known to feed from meat that has already begun to putrefy without ill effects. This could perhaps be why the Bengal tiger has no qualms over attacking sick, young and old animals that stray from the herd or are generally unable to keep up. In comparison to the Bengal tiger the Cheetah is able to outrun many prey items and prefers not to chase after older, weaker or sick animals and instead it will go for any animal that has been separated from the herd. Where many big cats prefer to hunt in groups the Bengal tiger is not a particularly cooperative animal and prefers to both live and hunt alone. Due to its size the Bengal tiger establishes a rather large living and hunting ground which is marked generally with urine. For male Bengal tigers the average hunting ground is around 20 square miles and for the female Bengal tigers the average hunting ground is around 17 square miles. Within their hunting grounds the tiger will build at least one den in which to sleep, raise young and sometimes return to with their kill. Bengal tigers are not welcoming to any other creature in their hunting grounds least of all other tigers. To ward off other tigers the Bengal tiger will spray the boundaries of its territory with urine and also emit growls and roars which can be heard for up to two miles. The only time that a tiger is accepting of another in its territory is during breeding season when neighboring male Bengal tigers step in to the female Bengal tiger’s territory to mate with her. The female Bengal tiger reaches sexual maturity at around 3 to 4 years and the male Bengal tiger reaches sexual maturity at around 4 to 5 years. When a male Bengal tiger has reached sexual maturity he will pass in to a neighboring sexually mature female Bengal tiger’s territory and mate with her. The male Bengal tiger can stay with the female for as little as 20 days and as long as 80 days; however, of that time period the female is only fertile for 3 to 7 days. The female Bengal tiger comes in to heat once every 3 to 9 weeks. After mating, the male Bengal tiger will return to his own territory and has nothing more to do with the young in the wild. In some national parks and conservation areas male Bengal tigers have been known to interact with their cubs, however. A female Bengal tiger carries a litter of 1 to 4 cubs at a time and gestates for around 105 days. When the female gives birth to her cubs she does so in the safety of a cave, a den or tall grass under shelter that will protect the cubs as they grow. At the time of their birth the Bengal tiger cubs weigh in at only around 2 pounds each and they are characterized by a particularly thick fur which will shed once the cub turns about 5 months old. The wooly fur serves to protect the small youngsters from the elements while they gain their bearings in the new world. At birth the young tiger cubs are unable to see or hear and they have no teeth so they are extremely dependant on their mothers for the first few weeks of life. At around 2 to 3 weeks the young tiger cubs grow their milk teeth which are quickly replaced by permanent teeth at between 2 to 3 months of age. The young tiger cubs feed on their mother’s milk as soon as they are born and once they turn around 2 months of age and have teeth they begin to feed on some solid food as well. At around 2 months old the young Bengal tiger cubs will begin to follow their mother when she goes hunting and observe her to pick up the necessary skills for when they begin hunting at around 6 months old. Bengal tiger cubs will not efficiently be able to hunt alone until they are around 18 months old, however. The young tiger cubs will remain with their mother and siblings for anywhere from 2 to 3 years at which point the family pack will split as the young cubs go out to establish their own territories. As is the case with many other wild cats the female Bengal tiger tends to stay closer to her mother’s territory when she establishes her own territory. The male Bengal tigers tend to stray further from the territory; it is believed that this helps to lessen the occurrence of inbreeding within the species. People commonly believe that the tiger is an outgoing hunter and will not hesitate to attack humans; however, this is rarely the case. Bengal tigers are rather shy creatures and prefer to stay within their territories and feed on “usual” prey items; however, certain factors can come in to play which push the Bengal tigers to seek an alternative source of food. On occasion Bengal tigers have been known to attack not only man but also other predators such as leopards, crocodiles and Asiatic black bears. While these prey items are not commonly eaten by the Bengal tiger the tiger may be forced to feed on them for a variety of reasons including: inability to effectively hunt usual prey items, lack of usual prey items in the tiger’s territory, or injury of the tiger due to old age or other causes. When tigers tend to attack other predators it is particularly likely that there is a lack of availability of the tiger’s usual prey items; however, when the tiger attacks humans it can be for any of the reasons listed above. A human is generally an easy target for the Bengal tiger and while it would prefer not to feed on a human, when it has no other alternative it can easily bring down a fully grown man even when incapacitated by injury. It is due to man that the population of Bengal tigers has dwindled to such pitiful numbers. As a result of both hunting and deforestation in the areas in which the Bengal tiger thrives, this majestic beast is being forced out of its home and left with little prey to feed upon when it is pushed in to smaller confines. Tiger skins have also been long prized by hunters and while it is not legal to hunt the endangered species, poachers still kill these beasts and sell their pelts on the black market for a pretty penny. It is the hope of conservationists that they will be able to help prevent this devastating behavior by guarding the species within national parks that have the ability to track populations as well as deter hunters that may venture on to the government-owned land. According to recent records of the Bengal tigers that are kept in captivity currently all but one are located within India which shows promise for the beasts. Being kept in their native land gives the Bengal tiger a leg up when it comes to breeding programs that aim to release captive bred tigers back in to the wild. The one Bengal tiger not being kept in an Indian zoo is a female that is being kept in North America. Maintaining the majority of captive Bengal tigers in India is not only helpful to ensure a more successful release back in to the wild but it is also helpful to ensure that the genetic blood lines of these tigers are not diluted by other tiger species. Genetic “pollution” as it is referred to, has already occurred within the tiger population beginning in 1976 in Twycross Zoo in England. The zoo raised a “Bengal” tigress and gifted her to the Dudhwa National Park in India in an attempt to prove that captive Bengal tigers could successfully live in the wild. As it turned out the tigress had not been a pure Bengal tiger and as a result the Siberian-Bengal cross had been allowed to breed with the pure Bengal tigers in the national park resulting in “pollution” of the gene pool. It may seem like a rather trivial thing to have a gene pool diluted, after all dog breeders do it all the time to create new breeds of dog that suit human desires; however, when it comes to Bengal tigers there is a huge difference. Whereas there are millions of dogs in the world in thousands of breeds, there are only a couple thousand Bengal tigers at most and by diluting the gene pools of these tigers we increase the risk that these giant cats will never again walk the Earth as they once did. At one time there were 8 subspecies of tiger; however, three of those have already become extinct and without consolidated efforts to breed purebred Bengal tigers to release in to the wild it is likely that one more species of tiger will become extinct fairly soon. To lose the Bengal tiger would not only mean that the world would be losing another animal species but it would also mean that the ecosystems where these tigers once thrived would be losing a large part of the natural order of things. For an ecosystem to lose one of the largest, if not the largest predator in the food chain would result in absolute chaos. Chaos within an ecosystem may not seem like much but much like the butterfly effect the loss of one species will result in the overgrowth of another, just the slightest change in that ecosystem will throw an entire area of the world out-of-order. It is the very least that we can do, as the species that helped to all but eliminate the Bengal tiger, to try to help repopulate the Earth with this magnificent creature. When it comes to conservation efforts for the Bengal tiger, the Terai Arc landscape in the foothills of the Himalayas is of particular importance. Lying in northern India and southern Nepal there are eleven areas in the Terai Arc landscape of interest. These areas are made up of tall grass savannas and dry forest foothills and create a protected area of 49,000 square kilometers for the Bengal tiger. The purpose of having these areas so close together is to allow conservationists to manage the tigers as one metapopulation. The population is spread between the protected areas to protect the genetic line of the tigers as well as to maintain ecological integrity. The protection of the tiger species in this area plays a significant role in reducing poaching of these endangered creatures. Another benefit that has come from the protected Bengal tiger habitats in the Terai Arc landscape is the local awareness of the need for conservation efforts. As more local people are made aware of the Bengal tiger’s plight, they become aware of their need to step in and advocate for this native animal. Project Tiger, launched in India in 1972, is a project that was launched in order to both preserve areas that are of biological importance as well as to ensure that a viable population of Bengal tigers remains in the country. The idea behind the project was to create a centralized population of tigers that would radiate outward in to neighboring forests. During the same year that Project Tiger was launched in India, the Indian government enacted the Wildlife Protection Act of 1972. This act allowed governmental agencies to take significant measures to ensure that the Bengal tiger remained protected. By the late 1980’s the project had grown from nine reservations to a total of fifteen reservations that were spread over 24,700 square kilometers of land. By 1984 it was believed that the area was home to more than 1,100 Bengal tigers. Unfortunately this population increase did not continue as a trend and while the Indian tiger population had reached 3,642 by the 1990’s, it once again took a nosedive and from 2002 to 2008 was noted as being around 1,400. The startling revelation that the tiger populations were so low in the 2000’s the Indian government began to set up eight new reserves dedicated to preserving the animal. The government pledged to fund an additional $153 million for the Project Tiger initiative. This money was to play a significant part in setting up a Tiger Protection Force to fight against local poachers and to relocate some 200,000 villagers who lived in close proximity to tiger rich land. Minimizing tiger and human interaction is a significant part of preserving Bengal tiger populations. In 2004 the Ministry of Environment and Forests for India has sanctioned RS. 13 million to be used for a mapping project. The project set out to map all of the forest reserves in India utilizing technology such as camera traps, radiotelemetry as well as prey counts, in order to determine accurate tiger population numbers. Prior to the use of such technology, officials were only guessing as to the local Bengal tiger population and unfortunately, they were severely overestimating! The use of technological gadgets to make a better population estimate was, at first glance, met with disapproval. However, as it was discovered that these technological advances were providing more accurate data, they were more readily accepted in to the conservation effort. To date the entirety of the Indian forest reserves have not been mapped. Captive breeding of Bengal tigers has taken place since 1880; however, unfortunately, this breeding often results in the cross breeding of tiger subspecies. In order to facilitate purebred Bengal tiger breeding in captivity, there is a Bengal Tiger Studbook. The studbook keeps note of Bengal tigers being kept in captivity. As of 1997, the International Tiger Studbook listed 210 Bengal tigers that were being kept in captivity across the globe. Of these 210 tigers, 209 were living in Indian zoos and only one female Bengal tiger was living in North America. The studbook is necessary in order to ensure that no cross breeding takes place within the captive Bengal tiger population. For example tiger C is born of tiger A and tiger B; therefore it would not be beneficial to mate tiger C with tiger A to produce more offspring. While it is important to breed a purebred Bengal tiger for the program, it is also important to ensure that interbreeding does not affect the health of those tigers being bred. The Re-Wilding project named “Tiger Canyons” was begun in 2000 by John Varty, a South African wildlife filmmaker. Together with zoologist Dave Salmoni, he trained captive bred tiger cubs to stalk and hunt prey and to associate hunting with food in order to re-establish predatory instincts in these cats. The object of the project was to have the tigers learn how to sustain themselves as they would need to do in the wild and then they would be released in to a South African free-range sanctuary. Unfortunately, the project met with many obstacles and criticism. Many believed that the behavior of the cats was being manipulated for the purpose of film footage. This wasn’t the most concerning aspect however; the tigers were all crossbreed tigers from Siberian and Bengal lines. The problem with using crossbreed tigers for the project was multifaceted. Primarily, researchers were concerned with the fact that these crossbreed tigers should not be used for breeding since they would not be able to contribute to the purebred population. Another cause for concern is that releasing these tigers in to the South African sanctuary after the project simply was not fair to the tigers themselves as they were not suited to the area as a result of being crossbred. The Cincinatti Bengals need to sponsor this and help out with this cituation! My favorite animal is going extinct!